There are lots of tools on the web for creating and hosting polls. You can find a list of some good ones here. Most of those polling services are simply text-based or text and images. Clip Choose is different because your polls are based on videos. 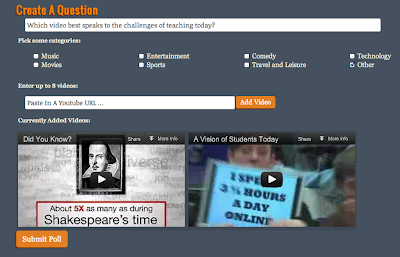 To create a Clip Choose poll you enter the URLs of up to eight YouTube videos. After entering your videos your audience then votes for their favorite video or whatever prompt you give them regarding the videos. Clip Choose is one of those resources that I sat on for a couple days because I wasn't quite sure what I would use it for. Then it hit me that Clip Choose could be a good tool to use to create video quizzes for a lesson about bias and propaganda. When teaching students about types of propaganda I could put two or three videos in Clip Choose and ask students to select the one that demonstrates the use of a particular propaganda technique. For example, if I wanted my students to practice recognizing the use of "glittering generalities" I would put in a video that demonstrates that method and two videos that don't.